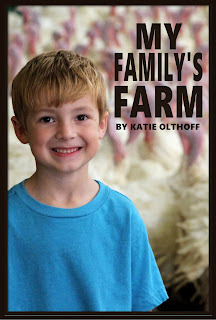 My Family's Farm has been a dream of mine for over two years, since I realized that there are very few children's books showing today's livestock farms. Farms have changed over the past 50 years, but their portrayal has not. This book is an effort to change that. The book is meant to appeal to a broad age range. The text at the top of each page, from 6-year-old Adam's perspective, is for younger children, while the in-depth information at the bottom of each page is directed at older students and adults. Most of the photos in the book were taken by me, on our farm, but a big "thank you" goes out to Joe Murphy (Iowa Soybean Association), Iowa Turkey Federation, Bob Haines (Iowa State Fair), Minnesota Turkey and the National Turkey Federation for additional photos. The turkey artwork was done by the uber talented Buck Jones. I also have to thank the Iowa Turkey Federation for their support for this project. A special "thank you" to Gretta Irwin, Executive Director, and Sheila Larson, Director of Member Services, who were both vital to this project. More thanks to my husband and sons for the photo shoots, Jenn at PDG Printing for helping with the logistics, and all the friends and colleagues who have read rough drafts of this book along the way. For more turkey activities, including free printables, check out the Iowa Turkey Federation's website here. Yay! So exciting. Thank you for sharing this with us! I just emailed this to HD's pre-k teacher and asked her to pass it along to the other teachers at his school! Yeah! Congrats!! !